I could have sworn that SanDisk made 256GB MicroSDXC cards already, but it seems like it didn't. It just announced them though, so I'm not awfully wrong anymore. There are two new cards in SanDisk's portfolio of super duper ultra high capacity: the SanDisk Extreme MicroSDXC UHS-I and SanDisk Ultra MicroSDXC UHS-I card, Premium Edition. I know that sounds confusing so I will break it down to you. Both of these cards can hold 256GB of storage and both are Class 10 cards for great Full HD video capture. They're both super fast too, and very resilient to shock, water, temperature changes, and X-rays, but the difference lies in one aspect. The Extreme card is also rated UHS Speed Class 3, which means that it can easily save 4K Ultra HD video. It's also slightly faster with transfer speeds up to 100MB/s compared to 95MB/s on the Ultra card. SanDisk's press release positions the Extreme card for action cameras, powerful drones, and 4K-capable smartphones, and the Ultra card for Android smartphone and tablet users who don't want to run out of space. 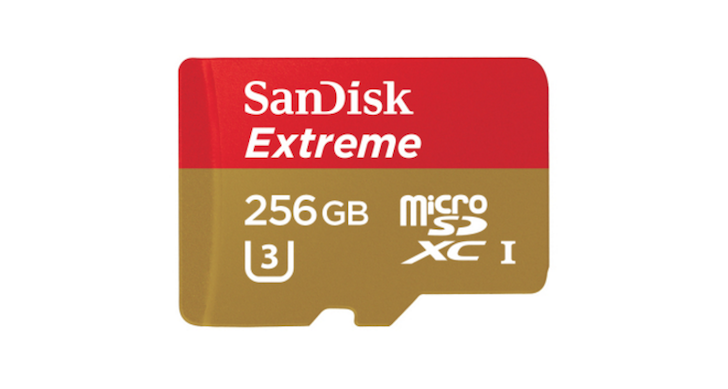 The 256GB SanDisk Extreme card will be released in Q4 2016 with an MSRP of $199.99, whereas the Ultra card will be available in August with an MSRP of $149.99. I can't wait for these to start showing up at around $50 in our deal alert posts, maybe in a year or so. SHANGHAI--(BUSINESS WIRE)--MOBILE WORLD CONGRESS – Western Digital® Corporation (NASDAQ:WDC), a global storage technology and solutions leader, today introduced a new suite of 256 gigabyte (GB) microSD™ cards, which includes the new 256GB SanDisk Extreme® microSDXC™ UHS-I card – the fastest microSD card in its class. The new suite of cards also includes 256GB SanDisk Ultra® microSDXC UHS-I card, Premium Edition, the first 256GB card optimized for mainstream consumers. The new additions deliver leading speed and capacity in a fingernail-sized card, giving smartphone, drone and action camera users the performance and capacity they need to capture professional-grade videos and photos without worrying about running out of space on their device. Whether taking pictures, shooting 4K UHD or Full HD video, or storing high-fidelity music, the new 256GB cards give consumers the freedom to capture and carry a massive amount of content on their devices without concern about storage limitations. 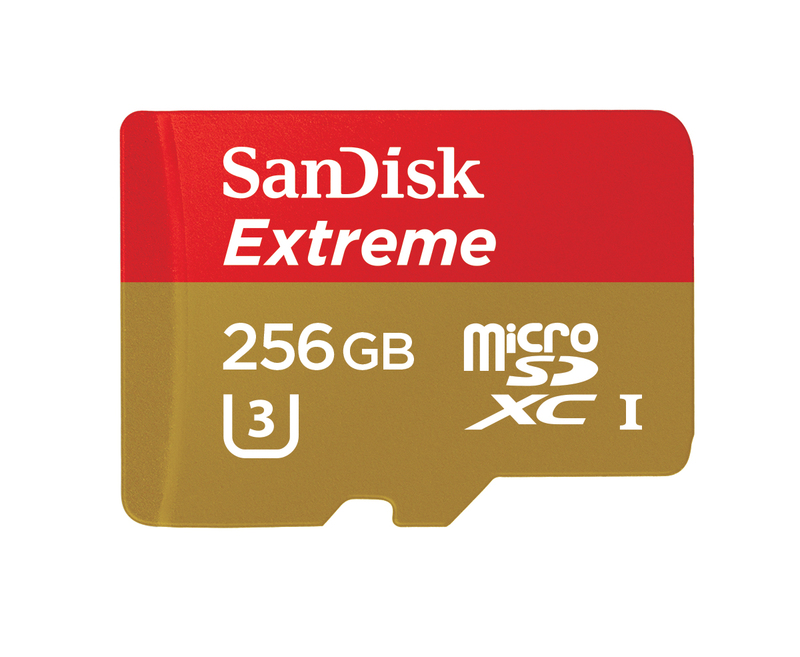 The 256GB SanDisk Extreme microSDXC UHS-I card delivers unmatched transfer speeds of up to 100MB/s**, allowing users to save time transferring large files, as well as write speeds of up to 90MB/s** for rapid capture of photos. Users can record an estimated 14 hours of 4K UHD video1 on the 256GB card, making it ideal for high-performance drones, action cameras, and 4K-capable smartphones, among other devices. 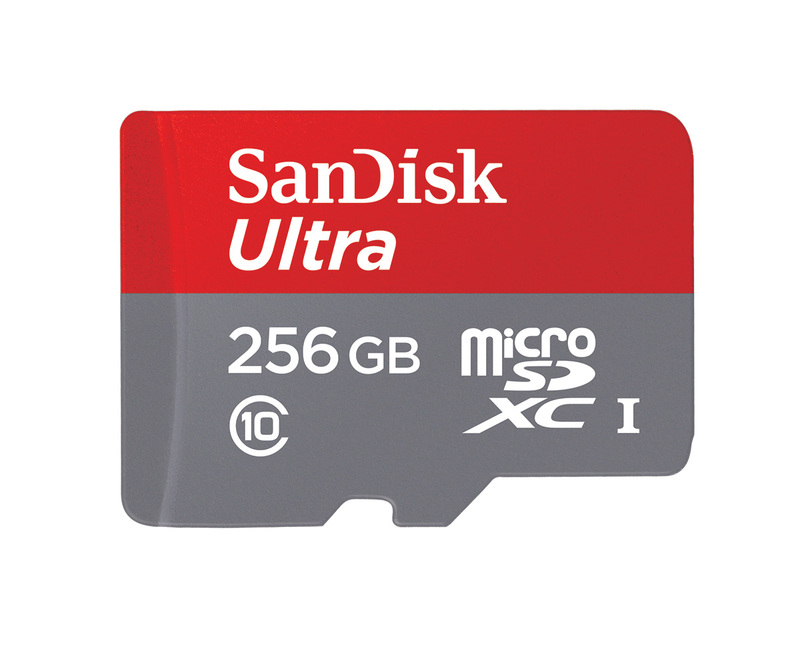 The 256GB SanDisk Ultra microSDXC UHS-I card, Premium Edition, is ideal for Android-based smartphone and tablet users who don’t want to worry about running out of space on their devices. The new card is capable of storing more than 24 hours of Full HD video1, and also features premium transfer speeds of up to 95MB/s**. At this speed people can move files quickly – up to 1,200 photos in just one minute2. Built to perform in harsh conditions, the new cards3 are also waterproof, temperature-proof, shock proof, and X-ray proof. Additionally, the SanDisk microSD card line up is compatible with the SanDisk® Memory Zone app for Android™, giving users an easy way to manage and back up content on their device. The app is available for free through the Google Play™ Store4. The new suite of cards is the latest breakthrough offering to join the cutting-edge SanDisk portfolio of mobile memory solutions. The first to introduce 128GB and 200GB microSDXC, and 512GB SDXC™ high-capacity cards, SanDisk continues to pioneer technology that keeps up with consumers’ evolving storage needs. The 256GB SanDisk Ultra microSDXC UHS-I card, Premium Edition, will be available worldwide in August 2016 with a U.S. MSRP of $149.99. The 256GB SanDisk Extreme microSDXC UHS-I card will be available worldwide in calendar Q4 2016 with a U.S. MSRP of $199.99. 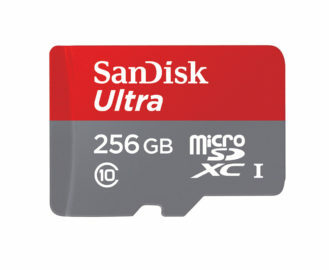 The complete line of SanDisk microSD cards can be purchased at more than 300,000 retailers worldwide. ©2016 Western Digital Corp. or affiliates. All rights reserved. SanDisk, SanDisk Ultra and SanDisk Extreme are trademarks of Western Digital Corporation or its affiliates, registered in the U.S. and/or other countries. The microSD, microSDXC and SDXC marks and logos are trademarks of SD-3D, LLC. Android and Google Play are trademarks of Google Inc. All other trademarks are the property of their respective owners. 1 Approximations; Results and 4K Ultra HD (3840x2160) / Full HD (1920x1080) video support may vary based on host device, file attributes and other factors. 2 Based on 4.1GB transfer of photos (avg. file 3.5MB) with USB 3.0 reader. Results may vary based on host device, file attributes and other factors. This news release includes forward-looking statements, including the expected availability and performance of SanDisk Ultra microSDXC UHS-I card, Premium Edition and SanDisk Extreme microSDXC UHS-I card. Risks that may cause these forward-looking statements to be inaccurate include among others: our product offerings may not be available when we expect or in the capacities or with the performance characteristics that we expect, or the other risks detailed from time-to-time in SanDisk Corporation’s and Western Digital Corporation’s Securities and Exchange Commission filings and reports. All statements made in this news release are made only as of the date of this release. Western Digital undertakes no obligations to update the information in this release in the event facts or circumstances change after the date of this release.